We recognize the importance of Chicago commercial snow removal for having clean, well-maintained, and safe commercial areas free of snow and ice 24/7 to ensure the easy flow of traffic in business locations. Safety, ease and accessibility are priorities for us when we work with our commercial clients in the Chicagoland area on snow removal and emergency response. Our Management Team creates a detailed service plan with the client prior to the first snowfall even occurring. This plan includes but is not limited to designated service areas, relocation areas, obstacles to avoid, safety and damage concerns, and de-icing locations. Brancato Snow and Ice Management provides high quality de-icing agents based upon the clients contractual needs. We only use the highest quality snow plows, pusher boxes, and deicing equipment for plowing, hauling, removing, and relocating snow and ice after every snow emergency. Whether you need a one-time service or ongoing snow plowing solutions for the snow season in Chicago, Brancato Snow and Ice Management can assist you with all of your winter commercial services. 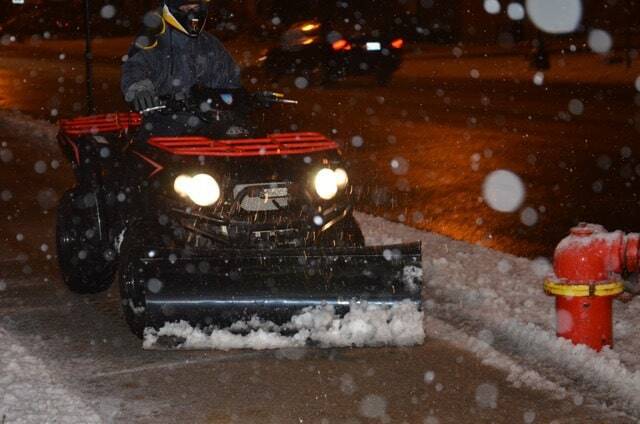 Our seasoned and trained staff is ready to handle any kind of snow emergency. Equipped with radio dispatches, all terrain vehicles and commercial grade snow plows, our team members also carry maps of all sites that are clearly marked with areas for clearing and relocating snow.